Home Federal Bank offers two types of Custom Check Cards in addition to our standard Visa Check Card. Who is eligible for a Custom Check Card? Customers who have a Home Federal Bank account with a Visa Check card. The primary account owner and any authorized users on the account can customize their card. How do I switch from a standard Home Federal Bank Check Card to a Custom Check Card? To create a new custom card, please Apply Online. You will receive a new Custom Check Card of your choice in the mail, embosses with a new card number. A new PIN number is also associated with your new card that will also come in the mail. The New/Replacement Card Fee will apply. What if I want to keep my existing Home Federal Bank Check Card and just add a custom image to it? Unfortunately we do not have the way to add custom images to our standard check cards without issuing a new card number and PIN. How often can I change my design to a customized Home Federal Bank Check Card? You can change the existing card for either the primary or authorized user as often as you like, being aware that a fee is involved at each image change. A fee of $10.00 will be deducted from your checking account linked to your Visa Check Card each time you create a new card. Please see our image specifications guide for our criteria for acceptable photo submissions. Home Federal Bank reserves the right to reject and image we believe violates our Image Specifications. If an image is rejected you will be notified by e-mail within two business days. You may submit a new image anytime following your rejection. What if I pay recurring bills using my Home Federal Bank Check Card? Anytime you order a new check card, verify if the card number has changed and then be sure to notify the venders initiating the payment of the new card number. All new/replacement Custom Cards come with a new card number, three-digit security code and PIN. After your request has been submitted and approved by Home Federal Bank you can expect your card to be mailed within 10-15 days. What will happen to my existing Home Federal Bank Visa Check Card? If my card becomes damaged or my names changes, what should I do? In order to have your existing card reissued with the same card number and PIN, please visit one of our branches or contact us at 308-382-4000. Can the joint account holder on my account also have a custom card, but with a different image than me? Yes. Each signer on the account may have their own, unique card of their choice. 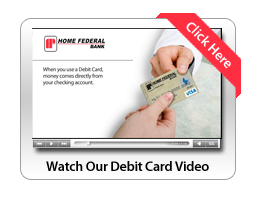 Have additional questions about creating your Home Federal Bank Custom Check Card? Contact us or call us at 308 382-4000.